TOKYO, Mar 22, 2019 - (JCN Newswire) - Hitachi, Ltd. (TSE: 6501) and the German Research Center for Artificial Intelligence GmbH (DFKI) jointly developed an AI based technology for quantifying physical load on a worker wearing a sensor suit(1) and for providing effective feedbacks on the movement of each body part. 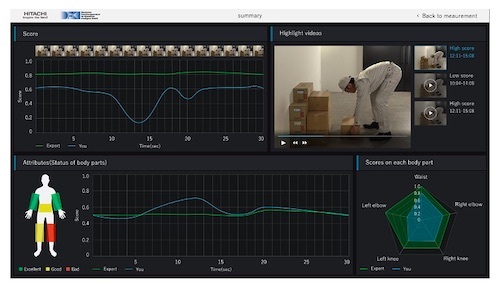 This AI technology performs real-time recognition and quantification of physical load exerted on a worker's body during work by using the motion data of each body part obtained through sensors in wearable devices. This technology makes it possible to provide effective feedback to workers on their differences from the model worker in the movement of each body part. DFKI and Hitachi will use this newly developed AI technology to assist operations and prevent dangerous actions, thereby contributing to ensuring safety, managing health, and improving efficiency on the front line of manufacturing.